It is with particular joy that I welcome you and thank you for your visit. I am especially grateful to Bishop Agathanghelos. Before all else, I ask you a favour: that on your return to Athens you convey my cordial and fraternal good wishes to His Beatitude Hieronymos II, who a few days ago, on 16 February, celebrated the eleventh anniversary of his enthronement. I ask the Father who is the giver of every good gift (cf. Jas 1:17) to grant him health, peace and spiritual joy. I pray too that, through the intercession of the Apostle Paul who preached the Gospel in Greece and crowned his witness by martyrdom here in Rome, he may abundantly bless the beloved Greek people. Cooperation between Apostolikí Diakonía and the Council for Promoting Christian Unity has been taking place for over fifteen years and has resulted in a number of praiseworthy cultural and educational projects. 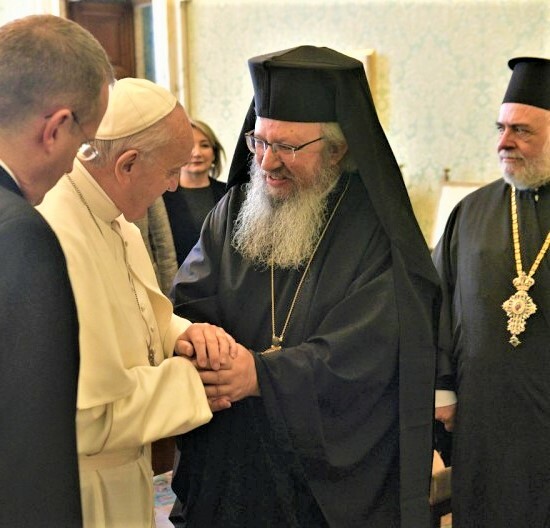 It is a fine example of how fruitful it can be when Catholics and Orthodox work together. In these years, both the organizers of these initiatives and those who have benefited from them, chiefly the young students of our Churches, have realized that what we have in common is much greater than what keeps us apart. Working together helps us to see one another as brothers and sisters. Our young people teach us not to remain prisoners of our differences, but to grow in the desire to journey together and to dream of surmounting the difficulties standing in the way of full communion. It is up to us to continue to advance together, to work together and to see ourselves once more as brothers and sisters. At every step, and in all we do, we can glimpse, with God’s help, his loving presence that leads us to ever deeper communion. I would like, then, to join with you in imploring the grace to make this journey. And to do so, not as individuals going their separate ways and working for their own goals, as if others were simply set at our side by history, but rather as brothers and sisters whom God’s providence has made us encounter as we journey together towards the one Lord, bearing one another’s burdens and rejoicing in each other’s progress. I thank Apostolikí Diaconía for the steps already taken on this journey, and I assure you of the support of the Catholic Church for its continuation. The pastoral care of the family is another fruitful field for cooperation between Orthodox and Catholics, one that needs to be cultivated with passion and urgency. In our time, marked by swift social changes that have resulted in an increased inner fragility, Christian families in a variety of geographic and cultural settings face many similar challenges. We are called to remain close to them and to help families rediscover the gift of marriage and the beauty of preserving a love renewed daily by patient and generous sharing and the quiet power of prayer. We are also called to be present wherever family life does not correspond to the fullness of the evangelical ideal, or is not lived in peace and joy (cf. Amoris Laetitia, 5). Together, then, while respecting our different spiritual traditions, we can actively cooperate in promoting, in various settings, both national and international, activities and initiatives having to do with families and family values. Once more, I thank you for your visit, and I ask the Lord to grant you his abundant blessings. I ask you, please, to save a place for me in your prayers. Thank you.